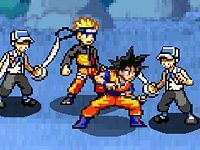 Many of your favorite anime characters can be found in this cool fighting game. Each one of them is looking to improve their skills and they could use your help with their training. Would you like to coach Monkey D. Luffy or show Goku from Dragonball how to pull off an awesome jump kick? Select your favorite fighter and get to work. DNF 2.9 is a different kind of fighting game. Instead of punching and kicking, you will use a variety of weapons to take down your foes. Show no mercy! These anime characters love a good game of basketball. Are you ready to take them on? See if you can dominate them on the court and pull off a few slam dunks while you’re at it.